A book I wasn’t sure I wanted to read, but a review in the local paper convinced me otherwise. For me the dry words of a geographical biography can be often mind numbing, but about two chapters into this book and it was apparent that was not the way this one would read. It’s not a love story, it’s not a hatchet job, it’s something in between, something that made me read the book almost straight through. I still was hesitant because of the way the author Sam Anderson jumped round from chapter to chapter, he talked about the land run and then one of the next chapters would be about James Harden, Sam Presti or Wayne Coyne – then Daniel Orton popped up and claimed a fair potion of the book. How did he really fit in the scheme of things? All of these were important parts of the book that made me both proud and angry at the people who started this city. And certainly furious at the some of the more recent shenanigans that has given Oklahoma City a poor reputation, one that has been at times richly deserved. Anderson explores all the high jinks and devious maneuvering that went on in the early days, how when cities and states around us were civilized, Oklahoma had its own laws. It wasn’t pretty. Names that are familiar to all who live here come alive as the history lesson unfolds in way that you won’t read in typical history books. Clara Luper comes alive with the sadness of the race issues that plagued and still plague this state and will haunt me for a long time. And the description of one of architects of the city, Angelo Scott, sounds like he could have been an ancestor of Sam Presti. But the parts that surprised me the most was the emotions I felt at retelling of the bombing and preceding days of McVeigh. Next, the descriptions of the famous tornadoes that hit in the city in 1999 and 2013. It made me feel physically ill as they came alive through another’s eyes and from the point of view of Gary England. I was never a huge fan of his before, that changed and the story just reiterated my feelings for David Payne. Not good ones. When the author starts retelling the life cycle of the NBA Thunder seasons, when they were hit with injuries, the trades and treason, I had to put the book down, even though I knew what was going to happen. As an outsider I also felt a bit vindicated for some of the feelings I’ve had over the years. Yes, finally someone else saw what I was watching from afar. Anderson starts off with the story of the killer of the killer of Jesse James – Red Kelley and jumps almost immediately into the saga of the Beard. The books takes lots of turns and twists with flashbacks to the early days of the land run and statehood, as well as the declines, booms and folly of the government. But woven throughout is the life cycle of the Thunder, mentioning things as fans we’ve never known about and a glimpse of the thinking of the powers that be. It was a fascinating read for me, a person who has never felt like I belonged here. I’m still not sure if I do – but now I can pinpoint some of the reasons why. The book finally ends on September 29, 2017, another boom day for Oklahoma. So many times I read how a loved one has passed away peacefully and surrounded by loved ones. I don’t know what was going on in Susan’s mind as she made that leap, but I can tell you that she was surrounded by loved ones, but wasn’t peaceful about it. She was still fighting and not ready to give up. She was even making physical therapy appointments while on hospice. She’s a warrior. Susan didn’t give up one bit. Another Leiomyosarcoma patient called her Rocky. Yes, she was and is a Rocky. Ever since she became a cancer warrior her mission was to fight. She fought the disease along with helping others learn how to both fight and learn how to accept that wicked diagnosis of Leiomyosarcoma. She did it with both grace and determination through her public journal of the daily struggles a cancer patient faces. She shared her story to the point of uncomfortableness at times for her family, but always letting others know of her strong faith. It was her therapy and way of dealing with the ups and downs of everyday life while struggling with cancer. We are grateful for the outlet it afforded her, even when it became so painful for us to read. Her grace and passion dealing with one of the nastiest diagnosis one can get was awe-inspiring. For those who read her posts and responded with positive and encouraging comments on Facebook, you will never know just how much you helped her. Helped her cope, deal with it, made her feel as if she wasn’t alone, which gave her the strength to keep fighting. Five years and three months and twelve days. That’s how long she fought. Think about your last five years and how much you’ve done or accomplished. How your life changed, babies, college, graduation, in hundreds of little and different ways. There’s a lot you can do in five years of life. she did too — her big accomplishment was exactly that, five years of life when her odds were about six months when she was starting the journey. She was a fighter, a warrior, one of my best friends as well as my daughter. She loved her family with a fierce passion. Her son and husband were the light of her life, everything she did, she did for them. I remember one time when life was particularly hard, she turned to me, feeling a little sorry for herself and impatient with others who would complain about minor life setbacks and said.. all I want right now from my life is to see Eli turn thirteen. She did that. And she also saw him turn fourteen and then fifteen. 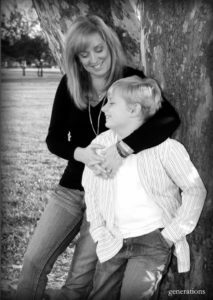 Five years, three months and twelve days of his young fifteen year old life has been spent with a mom fighting cancer. One third of his life. She had a dry sense of humor and was the true grammar queen. Even as I type this I am watching for errors, because she will know and probably send a thunder bolt crashing down nearby. She could spot a spelling mistake from 50 yards and, oh my gosh, do not, repeat do not ever put two spaces after a period. She would just shake her head in embarrassment and make sure I correct it immediately. Susan was born in Dallas and traveled north very grudgingly to Oklahoma when she was in middle school. She hated it. Every time she would get mad at me or Robert, remember she was junior high age, she would flounce to her room in a snit and we would soon hear her hammering away on the typewriter as she would write to her Dad about the injustices of her life. Then to rub salt into the wound even more, we moved to Oklahoma City during her high school years — not sure she ever forgave me for that. But if we hadn’t moved here, she wouldn’t have met the love of her life Ron. In the long run we did good! She grew up hating rules, and never had a rule she wouldn’t try to break. Or try to test me to my limits on a daily basis. One day stands out when she was around kindergarten age, a neighbor called me and asked me to please come down to her house. Uh oh. Susan and her friend had completely covered the neighbor’s wrought iron gate with mud, not one curve, turn or finial was even visible, it was all mud. When asked why, she said, “you never told me I couldn’t do that”. Out of all our kids, she was the one I thought would move far away as soon as she could. Nope, her family wound up living 300 steps away from us. That closeness was a precious gift for me, both physically and emotionally, during the last years of her young life. There is so much more I could and should say about Susan, but we’ve received so many notes, letters and cards telling us how special she was, that I know I don’t really have to tell people what she was like. She loved and was loved every day of her life. Death happens to all of us and it’s never easy to accept, especially family members and loved ones. It’s heart-wrenching and feels like the very essence of your being is forever gone. Absolutely no death is easier than another — but my only wish for you is that you never lose a child. A look back at our Disney trip — even though it’s years later, trading pins is still the way to go to keep the kiddos happy! When learning that a trip was planned to Disney World, an acquaintance suggested pin trading for my six year old grandson Eli. So we decided to give it a try. I already knew that pin collecting is extremely popular, but was amazed at how many actually do participate. It all starts with the Disney Cast Members (Disney employees not dressed in costume) who participate in pin trading. They wear a lanyard with pins or have a pin pouch attached to their belts. There were lots of Cast Members who trade pins, including quite a few of the staff at the stores, those monitoring the lines at the rides and many just walking around. Just ask a cast member to trade and as long as they are not busy with someone else, they happily oblige. In five days of pin trading we only had one grouchy person who obviously was not enjoying that part of her job. The pins the Cast Members trade include older pins, current pins found at the stores and recent issues. The problem is Eli also had to have a stock of pins to trade. I knew that buying at the parks could be expensive, so before we went we checked other options. There are numerous online vendors that sell Disney pins; After checking out the options, we bought 30 pins from a vendor selling authentic Disney pins for $1.35 each. No choice, bulk only, but postage was included. When the pins came in the mail, there was a great assortment of pins, many Eli wanted to keep for himself. But we suggested he take them in case there was a trade he might want more. Perhaps buying 30 pins was a bit much, but it kept Eli busy and happy with pin trading almost the entire time. And at $1.35 a pin, was much cheaper than the $6.95 – $12.95 for the individual pins available at the Parks. they won’t even realize they’re collecting on a budget. There were Disney pins everywhere. Kiosks and almost all stores had a selection, with a few stores devoted to pin collecting with literally had walls of pins. Make no mistake about it, Pins are a huge business for Disney and along with thousands of pins, there are also pin accessories. Books to put them in, refills for the books, lanyards of all descriptions, and decorative charms to hang from the bottom of the lanyard. Eli wanted to buy a couple of pins, but after convincing him to wait a day or two, he wound up finding the pins he was interested in during his many trade sessions. We did buy him a Chip n’ Dale lanyard and pendant, along with a small pin book. Wearing the lanyard signals that one is a pin trader and he was approached by a few other youngsters to see “what he had” for possible trading. As with all collecting, it’s best to focus in on a particular theme and character. There are so many categories in Disney pins, that one can easily get carried away. Luckily, the bulk pins we bought had several of Eli’s favorite Disney characters – Chip ‘n Dale. He quickly decided he would look for Chip ‘n Dale pins. There were loads of them, so he wound up with quite an assortment. Two pages worth! He did pick a few other pins, such as the Disney characters with Star Wars costumes. His favorite pin trade? A Wall-E pin that was selling at the stores for over $12. The first pin trade is the hardest. Eli was a little hesitant at first, but quickly got into the spirit. After a few trades he said “my friends who went to Disney World didn’t do this, this is fun. Wait till I tell them about it!” It gave him something to do besides continually checking out all the stores and filled time while waiting in line. It still can cost a bit of money, but there is a lot of bang for the buck when buying pins beforehand. Focus on particular characters or themes. The first pin trade is always the hardest, once you get a smile and a pin you’re looking for, the rest is easy. It might take a bit of time to find the ones you’re looking for, take your time and approach everyone with pins, but don’t feel you have to make a trade. Some folks collect only Hidden Mickey pins. A small Mickey head silhouette is on each pin, these pins cannot be purchased and are only available from Cast Member trading, but appeared to be readily available in trading. The character lanyards are fun to have, but are certainly not necessary. On a budget? Have a small pouch that the pins can be secured to or bring a lanyard from home. There were a few different styles of Disney pin books at the parks, we bought a small one with refillable pages, but it quickly filled up. We’ll probably get a larger book for his pins, but will save money by looking online. Want to get in on the fun, but don’t have enough pins to trade? Another option is to look for the mystery packs at Park stores. There are usually two pins in a pack, you don’t know what you’re getting, but the pins are lower in price. Still costly at $5. each, but excellent trade material. Most important have fun with the collecting. It’s not only for kids, lots of adults were also happily involved in the trading. Posted on November 26, 2017 | Comments Off on The Curtains That Ate the Christmas Tree. Yes, I really do know better. But the day after Thanksgiving sales had me pumped up and I wasn’t thinking. At least not about turning off the rotating Christmas tree stand as I normally do when leaving the house. A rotating Christmas tree stand is a wonderful way to show off your ornaments. We’ve used the EZ Rotating Christmas Tree stand for several years with a six foot white metal tree filled with gold glass ornaments. We finished decorating the tree and it looked spectacular. 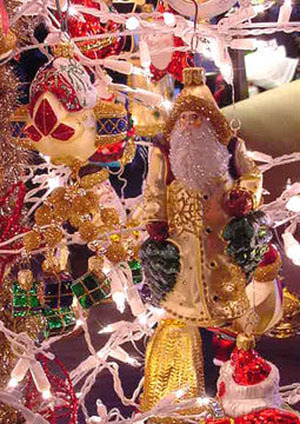 The golden glittered ornaments sparkled as the tree rotated, each piece getting the spotlight as it came into view. Satisfied, we left the house to do a little more shopping. An hour or so later we drove up to the front of the house and noticed the tree in the window. It looked very close to the glass. Like touching it. I don’t normally panic, but I did! When we get inside to investigate, the six foot metal tree, with over 100 Patricia Breen (very fragile and expensive) glass ornaments, is at a 45 degree angle touching the window. It’s held up ONLY by sheer curtains that are completely twisted around the top twelve inches of the tree. The sheer curtains are actually holding the tree very securely, but at the 45 degree angle. It took us over fifteen minutes just to untangle the curtain and we could only do that by taking the curtain rod off the window and the top portion of the tree off. Remember, we still have over 100 glass ornaments dangling from the tree. Two of us are holding the tree and the third person is trying to get the curtains and tree separated from each other. The curtains were very tightly wound around the tree. We finally untangle everything and gently set the tree upright, but the tree is very wobbly in the base. I tighten the screws, but it still tilts at least ten degrees.The next day all the ornaments are taken off and the tree is put back in the original stand that came with the tree in an effort to make the tree stand straight. The metal trunk appears to be straight, but the whole tree tilts in the holder. The next step is to get 3/4″ dowels and white duct tape, and tape the dowels to the metal trunk very tightly. The tree is finally stable, straight and doesn’t tilt. Next I wrapped gold garland around the dowels and tree trunk to hide the dowels. We love the EZ Rotating Stand and will continue to use it, but not with that tree! The closest tree branch was at least 15″ away from the curtains when the tree was set up. Not one single ornament fell of the tree during the whole ordeal and none were broken. Ornaments were not wired on, just were hung with long decorative hooks. I always turned off the rotating stand when leaving the house, but apparently the sales were too big a draw that year. The tree was never able to be repaired and was thrown away after the holiday season. Comments Off on The Curtains That Ate the Christmas Tree. Today was one of the best days ever. We were celebrating my birthday and daughter Susan planned the day for me. She picked me up and we hit a few craft shows in area, the first one was pretty small and not very promising. But we wound up buying some goodies at a bake sale and found a great Christmas present for a friend. One of the vendors had painted signs/sayings for sale. One sign was perfect for Susan, but it was pretty big, so reluctantly we passed on it. We continued visiting with other vendors and a few minutes later the painting lady came up to Susan with the sign and said she wanted her to have it. She insisted upon her taking the sign. We both cried. After two more small craft shows we wound up at a nearby cajun restaurant that we don’t get to eat at very often, especially since the guys in the family are not fans. Sorry guys, but it was as delicious as always. Next it was time to head home for a short rest and nap. A few hours later all five of us went out for a great dinner, I got to open birthday presents from my family that knows me all too well and an early bedtime soon beckoned. Like I said, a perfectly normal day. When a member of your family has a Stage 4 cancer diagnosis, those days are what we all long for and are so rare, but absolutely perfect when it happens.